Completed in December 2013 the project comprised removing an existing single storey rear extension of low quality and replacing it with a new open and light structure that would increase natural light and provide a more spacious form of living space. 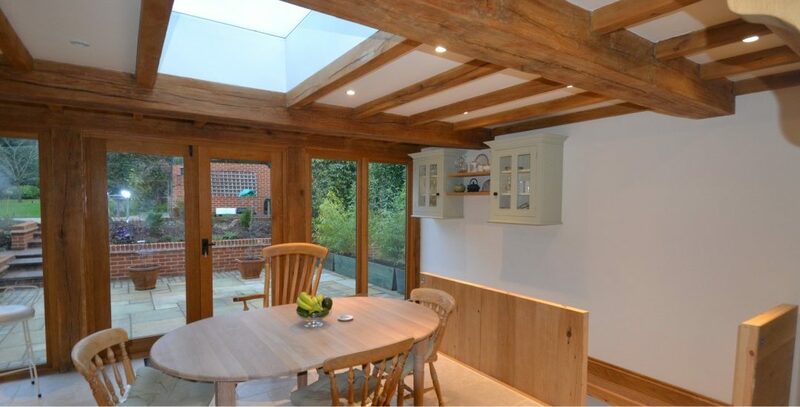 The extension provides a large kitchen/ dining space as well as providing a staircase down into a wine cellar. The kitchen looks through a new oak and glass structure to the mature gardens behind, ensuring a vista straight through to the garden when entering the house. Within the new extension is a guest kitchen and bathroom which also opens up to the garden, this is constructed from brick to provide a more private space. Large roof lights are provided above both of the new dining spaces and the guest bathroom The new outbuilding houses a double garage, utility space and a study overlooking the garden lawns. This was constructed from horizontal timber cladding and ensured the existing low quality flat roofed garage could be removed.